As the United States flew B1 Lancers based out of Guam in exercises with South Korea and Japan over the Korean Peninsula, the Trump White House was meeting with Pentagon officials on expanded details and strategies with regard to North Korea. Meanwhile, China continues to demand that all sides tone down the threatening talk and military activities. Has anyone asked China if they are accepting North Korea’s nuclear weapons as a standard condition? Additionally, more sanctions are taking place including blocking four cargo ships under North Korea’s authority from being received in several ports due to hidden illicit cargo transports as recently exposed in Egypt. Moving to preemptive strategies, South Korea is developing a new weapon called a ‘blackout weapon’ which is not to be confused with an EMP. This blackout weapon, known as a graphite ordnance was developed and used by the United States during the first Gulf War and later in the Balkans. The purpose of this weapon is to destroy the power grid in hostile nations as a part of the tactics applied where military actions are likely to escalate. Known as “blackout bombs,” the warheads can be dropped by a plane over power stations. 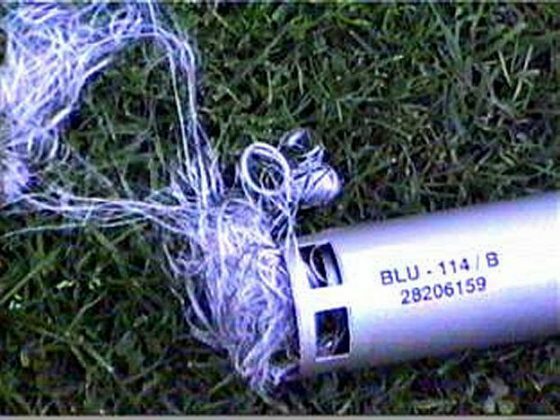 A form of cluster bombs, they split into several canister-like “sub-munitions,” which in turn release carbon graphite filaments that short-circuit the electricity supplies. South Korea is adding the weapons to its arsenal as part of one of its recently-developed military programs, the so-called “Kill Chain,” which aims to detect an imminent missile attack from the North and react with a pre-emptive strike. No shots are actually fired and there is no injury or death component to using the blackout bombs. The objective is the merely destroy power stations by short circuiting the systems. The BLU-114 was developed as a highly classified weapon intended to effectively neutralize electrical power infrastructure without destroying it. This weapon also has been referred to as the ‘soft-bomb’ or the ‘graphite bomb’. Like many other cluster bombs it can be released from virtually any tactical aircraft operated by the United States or allied countries. The BLU-114 disperses large numbers of chemically treated carbon graphite filaments which short-circuit electrical power distribution equipment such as transformers and switching stations. Used in large numbers it can even shut down the entire power grid of a given country. This weapon represents an excellent sample of non-lethal weaponry with near zero collateral damage. The CBU-94 Blackout Bomb is the main application for the BLU-114 warhead. It was reported to be employed during the conflict of the former Yugoslavia in 1999 short-cincturing the electrical power infrastructure of Serbia during operation Allied Force. It has been suggested that the BLU-114 or a very similar warhead was integrated into the Tomahawk missile and the AGM-154 JSOW standoff weapon. A tactic known as a ‘kill chain’ does not represent death, but rather it is a pillar as part of a first strike mission to begin the process of neutralizing battle-space. Applying all intelligence including satellite reconnaissance as well as cyber and signals intelligence is part of the operations in the stepped process to execute war strategies. The second and third prongs of South Korea’s defense strategy include missile defense and retaliatory strikes from aircraft in the event North Korea launches a missile. They include the Korean Air and Missile Defense (KAMD) system, and the Korean Massive Punishment and Retaliation (KMRR) plan. KAMD is a controversial plan to develop a system to intercept short-range missiles. KMRR is a concept for destroying Pyongyang in the event of a North Korean nuclear first strike. But it is the first and most dangerous part of the new military strategy – the “Kill Chain” – that has diplomatic observers worried. Such a pre-emptive strike would almost certainly lead to war – and not just any war, but regional nuclear war.